If you want to know Father Black Hawk, listen to his words. He has given us pages about his life experiences and feelings in his autobiography, first published in 1834 and edited by J.B. Patterson. Although some liberties were taken by the editor in the translation, Black Hawk tells us what he likes and what he dislikes, how he feels about his people and about his adversaries. He talks about family, about being a father, about life as a warrior, how he feels about alcohol and what it is like to be betrayed and oppressed. There is little guesswork to working with him if we just listen. 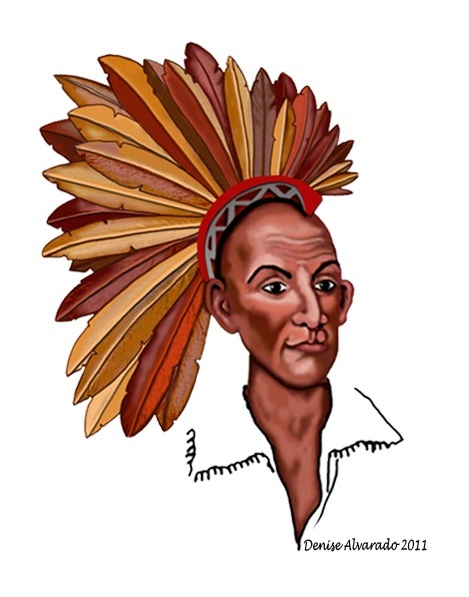 I strongly recommend anyone who wants to get to know Black Hawk to read his autobiography, as well as “Life,” by Benjamin Drake, also Drake's “Indian Biography,” and “Life of Black Hawk,” by W. J. Snelling. Black Hawk is growing in popularity within the growing conjure community online. The idea of keeping an Indian bust in a bucket is a novel one, but as you read Conjuring Black Hawk, the complexity of his life and the conditions in which he lived and died are anything but novel. His Indian name is Ma-ka-tai-me-she-kia-kiak, or Black Sparrow Hawk, and he was born in 1767 at Saukenuk, the principle city of the Sauk tribe located along the Rock River. Black Hawk was born into the Thunder clan. He chose to have only one wife, As-she-we-qua, or Singing Bird, although in Sauk culture polygamy was the norm. Black Hawk and Singing Bird had five children—two girls and three boys. According to Spiritualists, Black Hawk is a saint sent by God. It is said that when Black Hawk comes to help, God is right behind him. Anyone who is recognized as doing the work of the Creator is considered a saint, whether or not they have been officially canonized by the Catholic Church. To spiritualists, Black Hawk fights injustices and will come to your aid when called upon, even fighting battles you are too weak to fight for yourself. However, in Harry Middleton Hyatt's Hoodoo-Conjuration-Rootwork-Witchcraft, Black Hawk is referred to by some respondents as a bad saint, evil and up to no good. I find the clear difference of opinion between members of the Spiritualist Church, modern day rootworkers and Hyatt’s sample of old time rootworkers to be interesting, to say the least. But if we take a look at his life and the times in which he lived, and then look at the various contexts in which he is considered, it is not surprising to see divergent opinions. Want to learn more about Black Hawk? Preorder the book and join the email list to get exclusive access to the Members Only section of this website where there is an archive of images and articles all about Black Hawk and his life.